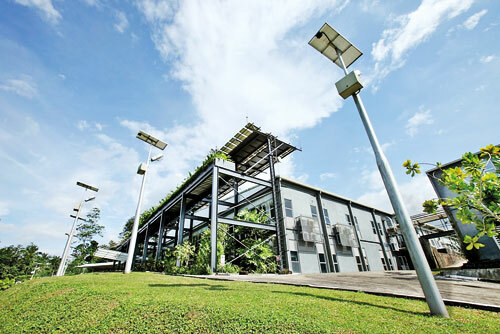 File picture of a Sri Lankan apparel factory using solar power. Local opposition to coal power generation in general, and the earlier proposed coal power plant at Sampur intensified largely due to poor track record of environmental management at Norachcholai – the only coal power plant in Sri Lanka, a recent report of experts has said. “It is true that neither ‘worst’ cases nor the ‘best’ cases can be used to justify any position. Nevertheless, emphasis on improving environmental management at Norochcholai is a key factor even for future coal power generation is to be taken into consideration,” the report on a ‘review of policy on shifting from coal power generation to LNG power generation’ has stated. The report by an independent panel of experts chaired by economist Prof. Sirimal Abeyratne and including Prof. K.M. Liyanage, Dr. Sumith Pilapitiya, Prof. Rahula Attalage, K.D. Ranasinghe and Prof. Kumar David and Merrille G.A. Goonetilleke, Additional Secretary (Technical), Ministry of Power and Renewable Energy as the Convenor was presented to the Cabinet Committee on Economic Management which later took a policy to shift to LNG generation in future. The objective of the study was to review the cost implications of this policy decision of the government to shift to LNG and to make policy recommendations. The executive summary of the report said that historical data confirm that electricity demand and economic growth moves closely due to both ex-ante factors (as industry and commercial demand for electricity pushes economic growth) and ex-post factors (because income growth pushes household demand for electricity). According to the Ceylon Electricity Board (CEB), electricity demand will double within 15 years (2015-2030) by growing at over 5 per cent per annum. As the country is at the doorstep of a take-off with an acceleration of its economic growth momentum, the corresponding electricity demand is expected to rise even further. term generation projects planned by the CEB, until the long-terms plans are implemented; (b) strengthening the current initiative of purchasing renewable energy from household and other sectors; and (c) encouraging household and other sectors to fix solar power panels to all new buildings to supply surplus of electricity generated to the national grid. Sri Lanka’s average electricity tariffs are considered to be high by international standards even after the reduction of tariffs recently; this is one of the important factors underlying the erosion of cost competitiveness in the economy weakening investor confidence. When electricity generation from the planned coal-fired plant or other energy sources as planned by CEB are not available within the next five years of time horizon, a feasible short-term alternative would have to be oil; apparently this will raise the cost of power generation and hurt the cost competitiveness which have to be managed internally, the report said. (a) Sampur should be retained as a suitable site for LNG power generation. Under the present circumstances, both technical and financial analyses may suggest the opposite, pointing to it as a costly option. Nevertheless, a large-scale LNG power plant at Sampur is expected to play a major role in contributing to the region’s potential economic growth and development within the next 10-20 years and in transforming the farming and fishing communities who will undertake jobs in the modern industrial and services sectors. (b) Coal may be a potential source of power generation in the future energy mix, provided that ground work needs to be prepared by evaluating and verifying its overall credibility. In this respect, in addition to the cost advantage of coal, the environmental and social acceptability needs to be enhanced. One of the important and urgent measures is to improve environmental management at Norochcholai. Common perception is that coal is cheaper than LNG. Financial cost of power generation, however, varies due to external factors (world market prices and the global trends in using fossil fuel categories) as well as due to internal choices made in terms of economic and technological factors, including the choice of source markets and purchase agreements. Within the fossil fuel category international coal prices have remained typically low and less-volatile compared to LNG prices which have moved closely with oil prices. Internal choices can result in cost differences due to different source markets (for either coal or LNG), plant location, scale of operations, and differences in technology, the report noted. Although it could be argued that one fuel type is better than another on the cost advantage alone, power generation cannot be treated in isolation due to its developmental issues, presence of externalities – both positive and negative, long-term implications, and locational implications on land and environmental values. Besides, even the international prices can change due to bilateral and multilateral agreements. Therefore, even power generation planning needs improvements to be competitive at international standards. Social, health and environmental impacts of transition from coal to LNG appear to be beneficial to the nation. This is revealed by the analysis based on technical impact assessments, and observations of local conditions including environmental management issues and international trends, the report said. The long-standing dispute over power generation causing issues in the power sector can be avoided by moving away from “fixed planning” towards “indicative planning” at CEB. Fixed planning entails achieving “pre-determined targets” under given assumptions and circumstances; the entire plan is likely to fail when the given assumptions and circumstances change over time. Indicative planning with its “rolling” character (i.e. frequent revisions under changing assumptions and circumstances) presents alternative options with adequate flexibility so that the government can choose the best feasible option, the report noted.